I was watching the Food Network this weekend and noticed on the previews for the Next Iron Chef they were going to be cooking on the Big Green Eggs (BGE), I had to tune in for that. Well they didn’t give the BGE a plug they just called it a cooking device, like you can’t tell it’s a BGE. Their eggs were already loaded with charcoal and all they had to do was light it. I have to say that I did think it was funny that a few of them had a hard time getting it lit and up to temperature. One of the chefs actually burned the skin of his chicken because the egg got too hot. But he liked the burned skin and convinced the judges it was intentional and they bought it. Most of the chefs just used it as a heat source and cooked over the egg using pots and pan, not really too exciting. 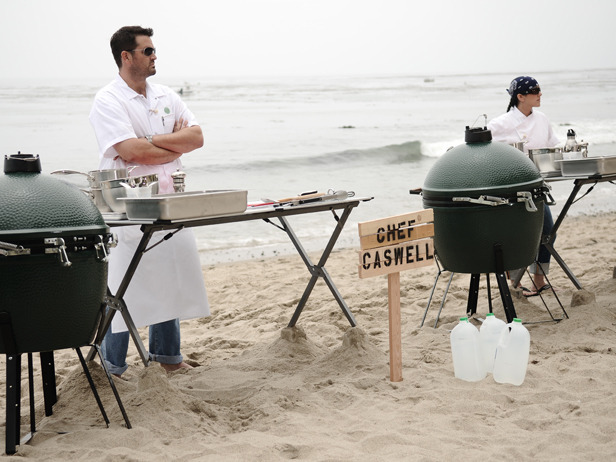 I was impressed with the chefs but I was disappointed with the lack of showcasing of the BGE.